Just like that, the Obamas’ summer vacation is already over. 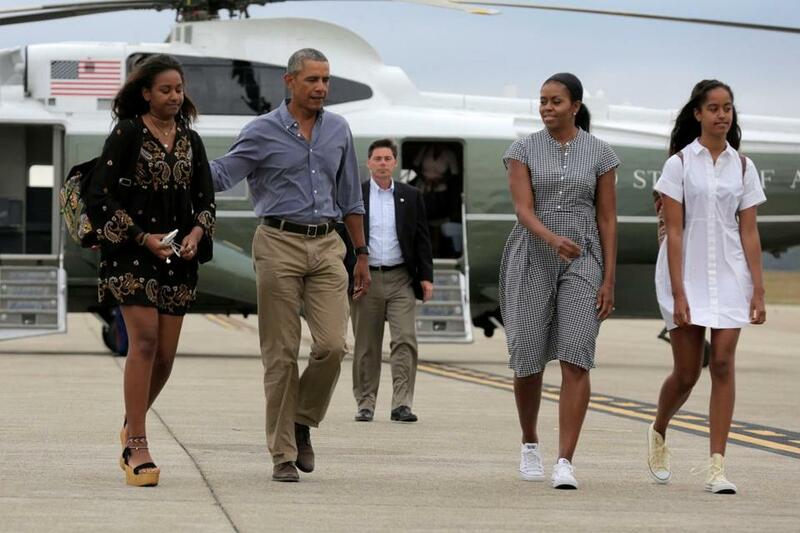 President Barack Obama, First Lady Michelle Obama, and their daughters Malia and Sasha boarded Air Force One on Sunday night to return to the White House following a 16-day vacation in Martha’s Vineyard, looking relaxed and refreshed after their New England getaway. The President reportedly began his Sunday with a hike with FLOTUS before playing his 10th round of golf while on vacation. Then it was back to business for POTUS, who headed back to Washington D.C. in a blue button-down, color-coordinating with his first lady. Michelle looked stunning in a blue-and-white checkered dress, pulling her hair back in a summery headband and accessorizing with on-trend white Converse sneakers. The power couple smiled and waved as they boarded their flight back home. Obama’s 18-year-old daughter Malia looked summer-ready in a button-up white shirt dress ($88; everlane.com) and high-top Converse, pulling her hair back in a half-up style. Her sister, 15-year-old Sasha, paired a paisley patterned dress with high platform sandals, layering on necklaces and anklets. Sadly, the President doesn’t have too long to enjoy the bliss of returning home after vacation: He heads out on Tuesday for a trip to Louisiana, where record flooding has killed over a dozen people and forced thousands of residents out of their homes. We hope the First Family enjoyed their relaxing getaway, as it’s sure to be a busy fall ahead. 21 year-old college student who loves sports and video games. Ready to make a name for myself and want to be an extremely popular sports writer.